Fig. 5.58 Left panel: sketch of the North Atlantic Basin showing the locations of sections; the Mid-Atlantic Ridge (MAR), Newfoundland Ridge (NR), Bermuda Ridge (BR), and Blake-Bahama Outer Ridge (BBOR) are indicated by dot-dashed lines; HAP and SAP represent Hatteras Abyssal Plain and Sohm Abyssal Plain, respectively; right panels: potential temperature distribution for several sections (adapted from Weatherly and Kelley, 1985). When grounding appears, bottom water is confined to the eastern boundary. Although it looks like an eastern boundary current, for the case of a flat bottom it is not a strong current. 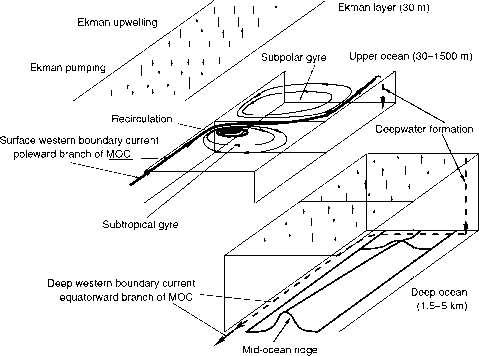 As a result of grounding, there will be an isolated northern boundary current and an isolated western boundary current whose structure has been discussed by Huang and Flierl (1987). These currents are separated from the main body of bottom water by a vast region where no bottom water exists. Weatherly and Kelley (1985) have found a nearly continuous filament of cold water which flows equatorward at 40° N and 62° W, left panel in Figure 5.58. From the water mass properties, it was speculated that this cold filament consists of AABW, as shown by the potential temperature contours in the right panels of Figure 5.58. Note that when grounding takes place, the bottom water piles up along the edge of the deep basin, including the eastern part of the continental slope. Although this may look like an eastern boundary current, it is a relatively slow current; thus, this current is quite different from the strong eastern boundary current due to the topographic j-effect. As shown by Speer and McCartney (1992), the inverse reduced-gravity model can give a fairly good description of this flow pattern. The bottom water circulation can be simulated in terms of an inverse gravity model. For example, Speer etal. (1993) discussed numerical experiments of an inverse reduced-gravity model aimed at understanding the bottom water circulation in a single-hemisphere ocean.